If you’re planning a trip to Amsterdam, you’ll probably want to check out its famous coffee shops and the Red Light District – and, by all means, do pay them a visit if you want to. But there’s so much more to this fascinating city than legalized soft drugs and adult entertainment. With its romantic canals, loads of museums, historic buildings, theatres and entertainment venues, the capital of The Netherlands is one of the most beloved tourist destinations for younger travellers. 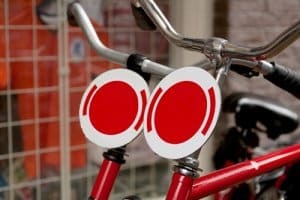 Did you know there are more bicycles than people in Amsterdam? This quintessentially Dutch transport means is a way of life for the locals and an excellent way for you to explore the city’s attractions or simply get lost wandering its picturesque streets. Thanks to the unbeatable network of cycling routes here, riding a bike throughout the city is not only enjoyable, but also as safe as possible. After all that biking, you’ll surely get hungry at some point – and what better way to refill your fuel tank than by trying out Amsterdam’s famous raw herring served at “haringhandels” all over the city? It may sound a bit intimidating to eat raw fish, but it’s absolutely delicious! This colorful store is the first specialized condom shop in the world, keeping the renowned red light district safe since the 80’s. The Condomerie is also an information center and has a small museum as well, hosting even novelty condoms shaped as frogs, chicken, or… Big Ben! The store has played a huge role in breaking the taboos surrounding STDs and contraception, making it much more than just a shop or a curiosity. Amsterdam has a long-running tradition of hosting lunchtime performances at Concertegebouw on Wednesdays, during which you can Experience the beautiful sound of young chamber music ensembles or even witness the Royal Orchestra rehearsing! If you’re into Jazz, you should not miss the Monday Match, a free music night held every month at the Bimhuis jazz venue, during which skilled musicians and dancers come together for an improvised performance. Considered by many as being the most charming area in the whole Amsterdam, Jordaan seems to have been lost in a past decade. Its quaint buildings, narrow streets, courtyard gardens, antique shops, art galleries and picturesque bars and cafés create an atmosphere you will not find anywhere else! The quirky streets around the grandest canals in the city form a unique, delightful micro-neighborhood known by the locals as “De 9 Straatjes”. Stroll the beautiful cobbled streets and you can find over 200 retailers you’ll be more than happy to give your money to, from designer and vintage shops to speciality stores and independent boutiques. The cultural heart of the city, Museumplein gives home to the famous Van Gogh Museum, the Museum of The Netherlands, and the Stedelijk Museum, the largest Dutch institution dedicated to modern art and design. With markets, open-air exhibitions and an ice skating rink during winter, the square is bustling with life every day. As you can see, the beautiful capital of The Netherlands has a lot in store for you. To make your experience here even better, book a room at Amsterdam Hostel Up Town offering you a comfortable and affordable stay, as well as convenient proximity to all the best attractions in the city.